Before becoming a heart recipient, Stephanie Zimmerman, RN, MSN was a nurse practitioner caring for pediatric cancer patients. Susceptibility to infections and rejection of the donated organ are two of the many side effects of undergoing a transplant. Stephanie shares her experiences on her blog: Living the Cure. Trips to the hospital is part of transplant life, thus it’s part of our family life. That being said, it has only happened three times in the last decade, so when it does, it unsettles, upsets, and upends us. Long story short, I was admitted to the hospital for a fever of unknown origin: urine and blood cultured, flu and RSV tests negative. I met the criteria for the hospital’s sepsis protocol scoring me a ticket to Club Emory St. Joseph’s Hospital. My husband arrived at the hospital within an hour, a little disappointed that he wouldn’t be enjoying Texas BBQ for dinner that evening. We waited together in the hallway of the ER – just like on Grey’s Anatomy- for a room upstairs. Once I was settled, John left to get our son, pick some things up at the house for me, then stop in for a brief visit. Because Atlanta traffic is THAT bad, we decided as a family that it didn’t make sense for them to drive down every single day given the technology available to us. Thankfully, I am home now finishing up a 14-day course of IV antibiotics as I give thanks that I am a nurse practitioner skilled in IV therapy. I saw home care today for a dressing change, then the line comes out on Monday when I have my follow-up visit with my FAVORITE infectious disease physician in the metro Atlanta area. So where exactly am I going with all of this?! Thanksgiving, of course. Our family was scheduled to host a small family gathering of 7 total for Thanksgiving. Hostessing does not come easily for me; it never has. I mean I can pull it off, but it’s stressful almost 100% of the time. However, last Wednesday, I did it! I took a stand for my health and wellbeing! 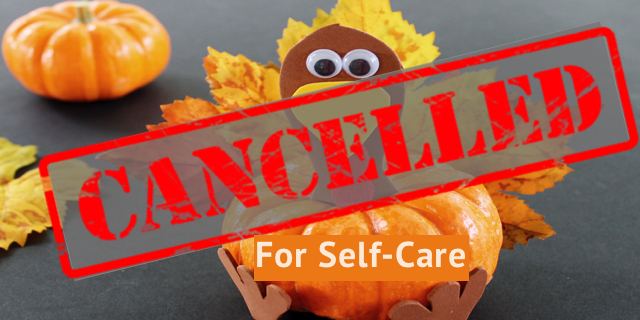 I made the call to cancel Thanksgiving! The sky did not fall, the earth did not tremble, and every family member understood. I mean who is going to blame someone who just got out of the hospital and continues on IV antibiotics at home the week of Thanksgiving for uninviting them, seriously?! So, I had a wonderful Thanksgiving with my husband and our teen-boy. Exactly what the doctor ordered. We have much to be thankful for and we gave thanks. People with chronic conditions have a non-negotiable need for self-care, managing expectations, articulating needs and delegation. Even if I had not been hospitalized, Thanksgiving was going to be different this year. I had already begun the process of delegating such that I supervised more than anything; I want to be present, to be able to enjoy my family and friends throughout the holidays, but that looks different for me and that’s okay. AND I am not ashamed to admit that I ordered an oven roasted ready-to-serve whole turkey from Honey Baked Ham and served one of each of our favorite comfort foods from our childhood: green bean casserole for me; potatoes au gratin for my husband; and corn for my son. Easy-peasy; I like SIMPLE!